There is a burgeoning literature on the epistemic significance of disagreement. 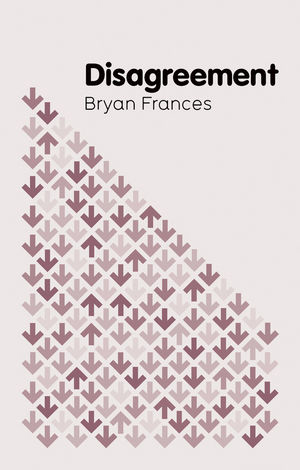 Bryan Frances’ book, Disagreement, is a well-written and thorough introduction to the epistemic issues surrounding this philosophical issue. This timely book is introductory in nature and provides an excellent launching point for entering into the contemporary debate on the epistemic significance of disagreement. Disagreement borders both theoretical and applied issues in epistemology with a focus on real-world applications. Frances’ book exemplifies careful and systematic philosophical thinking and employs the method of cases. The book progresses in a systematic manner, with clear definitions, accessible examples, review chapters, as well as sample study questions. To help student and professor alike, the book also has progress summaries scattered throughout. The book is split into two sections: the first clarifies the central questions relevant to the epistemology of disagreement and the second analyzes some intuitive answers. In what follows we will provide an overview of the book and raise several critical points. Disagreement Question: How should I react to the realization of a disagreement? Better Position Question: Which participant(s) in the disagreement are in a better position to correctly answer the question? Frances argues that answering the Better Position Question is central to answering the Disagreement Question. He claims that there are three epistemic statuses relevant to the Better Position Question: epistemic peer, inferior, or superior. Epistemic superiors are in a better epistemic position than epistemic inferiors whereas epistemic peers are roughly on the same epistemic level as each other. Frances highlights the following disagreement factors as relevant for one’s position on a question: data, evidence, time, ability, background (non-factual) knowledge, and circumstances of investigation (26). In brief, data encompasses the facts about the disagreed upon belief in question; evidence includes the propositions and facts that you use to support your doxastic attitude; one can spend more or less time thinking about a problem than others; ability refers to a person’s cognitive abilities, meaning a person might have more or less natural ability when it comes to thinking about the problem (e.g. a person might just be more math-minded than another person); background knowledge is all other relevant information that an individual can bring to bear on the disputed topic; and finally the circumstances of the investigation can differ, which means there could be some temporary factors that affect one of the party’s ability to reason (e.g. drunkenness, sickness, distractions, etc.). Frances then proposes three seemingly reasonable rules of thumb for dealing with disagreement: Peer Rule, Superior Rule, and Controversy Rule. Briefly, the Peer Rule states that if you justifiably believe, before the disagreement, that you and your disagreeing interlocutor are peers, you should suspend judgment; the Superior Rule says that if, before disagreement, you justifiably believe that your disagreeing interlocutor is your superior, then you should change your belief and your superior can keep their belief (the opposite goes for if they’re your inferior); and the Controversy Rule states that if your belief in B is highly controversial amongst the general public, but a large amount of experts agree with your belief, then you can keep your belief in B. In the second section of Disagreement, Frances proceeds to critically examine and refine these three rules of thumb. Frances proposes a number of additional cases that appear to be counterexamples to each of the initially intuitive rules for dealing with disagreement. Frances revises the rules in question, but in turn presents additional candidate counterexamples to the revised principles as well. In the end we are left without any universal principles to follow in responding to disagreement. Frances then turns to discussing different versions of two influential principles in the literature on the epistemology of disagreement: Uniqueness and Independence. According to Uniqueness, one’s evidence reasonably supports one and only one unique doxastic attitude, or level of confidence, toward the proposition in question; all other competitor doxastic attitudes are unreasonable. According to Independence, your belief regarding a person’s epistemic status (as a peer, superior, or inferior) must come from evidence other than the evidence that supports your belief in question. Finally, Frances returns to addressing the Disagreement Question, ultimately arguing that there is no clear cut answer; there are some cases in which it is reasonable to retain your belief and yet other cases where it is unreasonable to retain your belief. In the final chapter, Frances raises the skeptical worry stemming from disagreement – that disagreement could have it that we’re far less justified in believing a number of controversial propositions that we believe. We turn now to raising several criticisms. B: the belief upon which you and your interlocutor disagree. Frances claims that, in cases of disagreement where the subject has much better overall evidence for B (the target belief) than for P (the peerhood belief), it is typically reasonable for her to stick with B (146). Whether this is so depends upon how we think of the evidence supporting the claim that one has made a mistake. Putting things in terms of defeaters, if we think about the evidence that someone is your peer and disagrees as a rebutting defeater for your belief B, then what Frances claims will likely be correct. However, if such evidence is better conceived of as an undercutting defeater for B, then it is hard to see how Frances’ claim could be correct. Undercutting defeaters (unlike rebutting defeaters) need not be as justified as the beliefs they are undercutting in order to be full defeaters. So, central to this issue will be the nature of such disagreement evidence and how it functions, yet it is not clear if, or why, the rebutting defeater approach that Frances seems to defend is more fitting. Frances’ focus in Disagreement is mainly on the rational response to disagreement (how one should update their beliefs), where this is a distinct issue from what one’s total evidence supports at the time. While both issues are worthy of attention, it seems to us that the question of how one should rationally respond is of less interest than the question of what one should believe at the time in question. As Frances notes, one can have a rational reaction to a disagreement even if they have been unreasonable in dealing with the relevant beliefs prior to discovering the disagreement (so long as one uses those beliefs correctly in updating) (143, 167). In such cases, Frances claims that keeping the belief is reasonable even though the belief kept is not (200). While the distinction between rational responses and rational beliefs is helpful (and clearly made by Frances), we take it that the core question in the epistemology of disagreement concerns rational beliefs rather than rational responses. Along those lines, further treatment of that issue would have been beneficial. In sum, Frances’ Disagreement is an accessible and well-argued introduction to the debates surrounding the epistemic significance of disagreement. We recommend this book to those interested in exploring this rich epistemological topic. Feldman, Richard. “Respecting the Evidence.” Philosophical Perspectives 19, no. 1 (2005): 95-119. Matheson, Jonathan. “Conciliatory Views of Disagreement and Higher-Order Evidence.” Episteme: A Journal of Social Philosophy 6, no. 3 (2009): 269-279. Matheson, Jonathan. The Epistemic Significance of Disagreement. Basingstoke: UK: Palgrave Macmillian, 2015. For accounts that take disagreement evidence to be an undercutting defeater see Feldman (2005), Matheson (2009), and Matheson (2015).